Hello! Welcome to Day 3 of Taylored Expressions August Sneak Peeks! 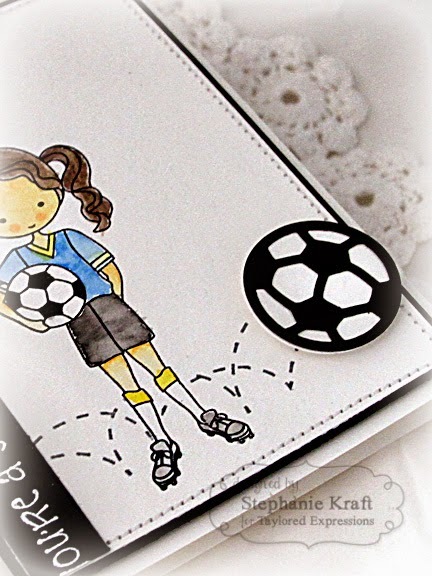 We are releasing 12 new stamp sets and 16 new dies! All products will be released tomorrow, Thursday, August 8, @ 7 AM PST. Today I've used one of the newest Mokas... this one is Moka Madison. Once again I pulled out my water colors to color her. I stamped and colored directly on Choice Watercolor paper. After masking her, I added the bouncy ball dashed lines (from All-star Accents). The soccer ball was created using Sports Balls and popped up with foam tape. Accessories: Taylored Dies: Sports Balls (TE), Gansai Tambi watercolour (Kuretake), Star Sprinkles (Doodlebug), White embossing powder, Foam tape, Thread, Sewing machine. Great card!! 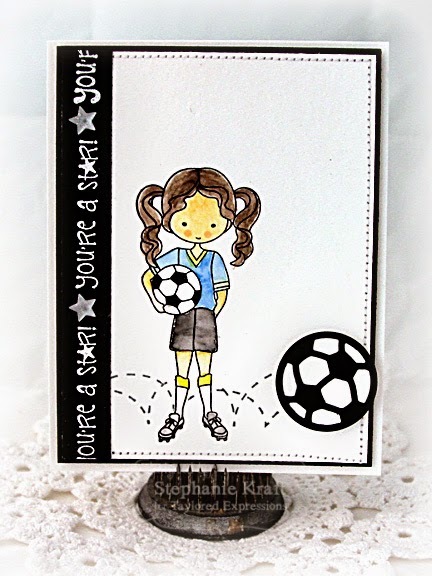 Love the stamping going up the side! Great card! Love the stitching and the ball bouncing off the side! Great job on this card. The stitching makes it extra special and I love the repeated phrase stamping. Looks very cool!